When it comes to the secrets of living a healthy life, it seems that there are no secrets. From diet gurus to celebrities, everyone seems to have the answers on healthy living. Since the 1980s, the United States government has also weighed in, with dietary guidelines that it publishes every 5 years. The intent is to provide research-backed diet and physical activity recommendations to reduce the risk of diseases linked to poor diet and activity, such as high blood pressure, heart disease, and type 2 diabetes. Here is a round-up of the government’s latest key recommendations from the publication, 2015-2020 Dietary Guidelines for Americans. In recent years, obesity has been a national concern, since it has been associated with serious conditions like cancer, heart disease, and type 2 diabetes. Controlling total calorie intake is essential to maintaining ideal body weight. If you are trying to lose weight, you will need to expend more calories than you take in. This means getting plenty of exercise and cutting down on foods that are high in calories. So how many calories should you be consuming? This depends on several factors, such as age, gender, height, weight, and physical activity level. To keep calories under control, you want to focus on eating foods full of many nutrients, especially potassium, fiber, vitamin D, and calcium. You may want to talk with your doctor or a registered dietitian about an eating plan that is right for you. In general, try to keep calories in check. Aim to meet calorie needs, but not exceed them. Reducing portion size and eating more meals at home are great ways to avoid exceeding calorie needs. In addition, eating foods high in nutrients but lower in calories can help. Eat a lot of fruits and vegetables—Fresh fruits and vegetables are lower in calories compared to processed foods. Focus on color when eating fruits and vegetables. Dark green, red, and orange vegetables are especially packed with good-for-you nutrients. When preparing a meal, try and fill half your plate with fruits and vegetables. Eat a lot of whole grains—Examples of whole grains are brown rice, oatmeal, bulgur, and whole-wheat pasta. Your goal should be to make half your grains whole grains. Have more dairy—Focus on low- or non-fat milk, cheese, and yogurt. It is okay to eat certain fats—Some fats are okay to consume in moderation. These are monosaturated or polyunsaturated fats, which are found in foods like nuts and fish. Power up on protein—Seafood, lean meats, poultry, beans, and soy products are good sources of protein. Be sure to choose protein foods that are low in saturated fat and calories. Limit refined grains—Examples of refined grains are white bread, corn flakes, grits, regular pasta, and white rice. These foods tend to be high in calories and sugar but low in fiber. Limit foods containing added sugars—This includes sugar-sweetened drinks and snacks. Limit foods high in saturated fats—This includes certain kinds of meat and dairy products (whole milk, cream, and butter). Less than 10% of calories should come from saturated fats. Keep trans fat consumption as low as possible—You can do this by limiting foods containing solid fats and partially hydrogenated oils, such as margarine and baked goods. Limit salt intake—Too much of it can increase your risk for high blood pressure, which can lead to kidney damage, heart disease, and stroke. On a daily basis, adults should consume less than 2,300 mg of sodium. If you drink alcohol, do so in moderation—Women should consume no more than 1 alcoholic drink a day, while men should consume no more than 2 drinks a day. Also, keep track of the calories in each drink. Mixed drinks tend to have higher calories. When eating grains, make sure half your grains are whole grains. Choose fat-free and low-fat (1%) milk products. Enjoy your food, but be mindful of how much you are eating. Try to eat less. When cooking, try to use less or no salt in the recipe. When you eat your meals, do not add any extra salt. Over time, you will adjust to less salt in your food. 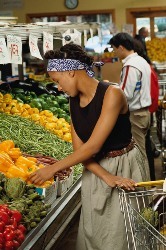 You can find specific information on the ChooseMyPlate website. A nutritious diet and exercise go together for maintaining a healthy lifestyle. To achieve and maintain a healthy body weight, adults should aim for 150 minutes of moderate to intense physical activity each week. Some examples of activities are brisk walking, biking, and swimming. Before starting any kind of exercise program, be sure to check with your doctor if you have any health issues that may limit your exercise program. Guidelines provide the foundation for a healthy lifestyle. But living a healthy lifestyle takes discipline and a positive attitude. Working with your doctor and perhaps other professionals, like a dietitian or fitness trainer, can be helpful in keeping you motivated and on track for reaching your health goals. Also, a healthy lifestyle should not be a chore, but something enjoyable. Make exercise fun—a weekend hike, a lunch-hour walk with co-workers, or a pick-up game of basketball with your neighbor are just some ideas. And when mealtimes roll around, put on your creative chef hat! Come up with new approaches to breakfast, lunch, and dinner menus that incorporate fresh, nutrient-dense foods, and get friends and family involved in preparing meals. Experiment with herbs and spices to flavor your meals instead of the old salt standby. Armed with guidance, support, and motivation, a healthy lifestyle is within your reach! 2015-2020 Dietary guidelines for Americans. US Department of Agriculture and US Department of Health and Human Services. Available at: https://health.gov/dietaryguidelines/2015/guidelines/. Accessed February 14, 2017. BMI calculator. ChooseMyPlate—US Department of Agriculture website. Available at: http://www.choosemyplate.gov/weight-management-calories/weight-management.html. Accessed February 14, 2017. Dietary interventions for cardiovascular disease prevention. EBSCO DynaMed Plus website. Available at: http://www.ebscohost.com/dynamed. Updated February 5, 2015. Accessed March 9, 2015. What is MyPlate? US Department of Agriculture ChooseMyPlate website. Available at: https://www.choosemyplate.gov/MyPlate. Accessed February 14, 2017.